Fun fact of the day about me: I struggle with taking compliments. Sometimes I stutter. Other times I say “thanks” ridiculously fast and change the subject. And then there are the times that I feel the need to reciprocate the compliment immediately and it comes out all wrong. Like the time my highschool boyfriend told me I looked gorgeous before a dance and I said ohhhh thaaanks…so do you! Color me smooth. Now that you’ve been adequately prepped, you can excuse me for this potentially awkward blog post. 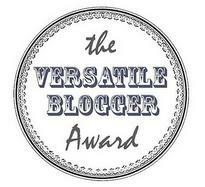 A dear friend of mine over at Caffeinated & Random has nominated me for the Versatile Blogger Award! Thank you, Jenny! You look gorgeous, and you’re a versatile blogger, too! There is a set of rules I have to follow, so here goes nothin’. Rule #1: Thank the award-givers and link back to them in your post. Done and done. Rule #2: Share 7 things about yourself. Oh god, here it is. Another thing I struggle with…you’ll see. 1.) I absolutely love writing. However, I hate hate hate writing about me sections. My Facebook “About Me” section took me longer than I care to admit. 2.) I’m a social media nerd. As a blogger, that probably isn’t that surprising…but I could spend a day on Facebook and be ok with it. Well, maybe not just Facebook, but definitely Facebook and Pinterest. 3.) I’m a natural redhead. I used to have a picture of myself on here but once it became 2 years old, I took it off. But yes, I’m a redhead but not a full on ginger. And while we’re at it – contrary to popular belief, I do have a soul. 4.) Cooking is my therapy. If I’m having a bad day, I’ll come home and cook. Cupcakes, cake, a meal, a snack, all of the above, I love to do it. I love sampling with different flavors and making up my own concoctions. While I can’t do that with baking just yet, I have hopes of making up recipes for cakes and cupcakes, just like I do for meals. 5.) I hate nothing more than being cold, and I’m never warm. Life is rough. On an 80 degree night (when I’m staying in), you can find me in jeans and a t-shirt, wrapped up in a blanket on the couch, most likely debating whether or not I need my heated blanket. Imagine me during the winter months…it’s scary. 6.) Ever since 6th grade, I’ve had dreams of living in Nashville. To me, it’s the perfect mix of city and country and the music scene is amazing. The area is gorgeous and Chicago winters are miles away (see #5). I also want to live in L.A. at some point. We’ll see how these dreams go. 7.) For a talent show in elementary school, I played Mary Had a Little Lamb upside down on the piano. You’re probably picturing this correctly. I basically did a bridge over the piano bench, putting my head underneath the piano, crossed my arms and played. I saw someone do it on Nickelodeon’s “Figure It Out” and figured out I could do it, too. Rule #3: Pass this award along 15 or 20. I have to be honest, I’m not sure who I’ll pass this on to, yet, but I promise I will! Turn it Up – Someday, I hope to write as well as Greg Kot. Suri’s Burn Book – I read this to laugh and laugh and laugh and laugh. What Kate Wore – I’m obsessed with Kate Middleton and her closet. This helps to fuel that fire. Oops, I suppose you now know 8 things about me. Caffeinated & Random – You should see how random we are when we’re together. I read this to pretend like she didn’t move to D.C! Thank god for gchat. Rule #4: Contact your chosen bloggers to let them know about the award. This is officially at the top of my to do list. Thanks to everyone who makes an effort to stop by from time to time. I can’t express how much it means to me. Tags: Awards, blogs, HauteThought, Versatile Blogger Award. Bookmark the permalink.